Loganberries are succulent berries that are delicious eaten out of hand or made into pies, jellies and jams. They don’t ripen all at once but gradually and they have a tendency to hide underneath leaves. This makes it difficult to know when to pick loganberry fruit. So when do loganberries ripen and exactly how do you harvest loganberries? Let’s learn more. Loganberries are an interesting berry in that they are an accidental hybrid, a cross between a raspberry and a blackberry. They were first discovered in the garden of James Harvey Logan (1841-1928) and were subsequently named after him. Since their inception, loganberries have been used to hybridize boysenberries, youngberries, and olallieberries. One of the more hardy berries, loganberries are sturdier and more disease and frost resistant than other berries. Because they do not ripen all at once, are difficult to spot amidst the foliage and grow from thorny canes, they are not cultivated commercially but are more often found in the home garden. So when do loganberries ripen then? The berries ripen in the late summer and look much like blackberries or very dark raspberries, depending on the cultivar. 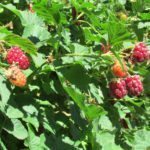 Loganberry harvest time is fairly lengthy since the fruit ripens at different times, so plan on picking the fruit several times over the course of two months or so. Before harvesting loganberries, dress appropriately. Like blackberries, loganberries are a tangle of thorny canes hiding hidden gems of fruit. 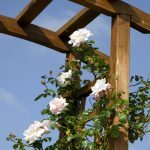 This requires armoring yourself with gloves, long sleeves and pants as you go in to do battle with the canes unless, of course, you’ve planted the American thornless cultivar, which was developed in 1933. You will know it’s loganberry harvest time when the berries turn a deep red or purple towards the end of the summer. Loganberries, unlike raspberries, do not pull free easily from the cane to indicate ripeness. The time of year, deepening color and a taste test are the best ways to determine if you can begin harvesting loganberries. Once harvested, loganberries should be eaten immediately, refrigerated for up to 5 days, or frozen for later use. 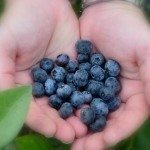 This homegrown berry can be used just as you would blackberries or raspberries with a flavor just a bit tarter than the latter and packed with vitamin C, fiber and manganese. Read more articles about Loganberry.